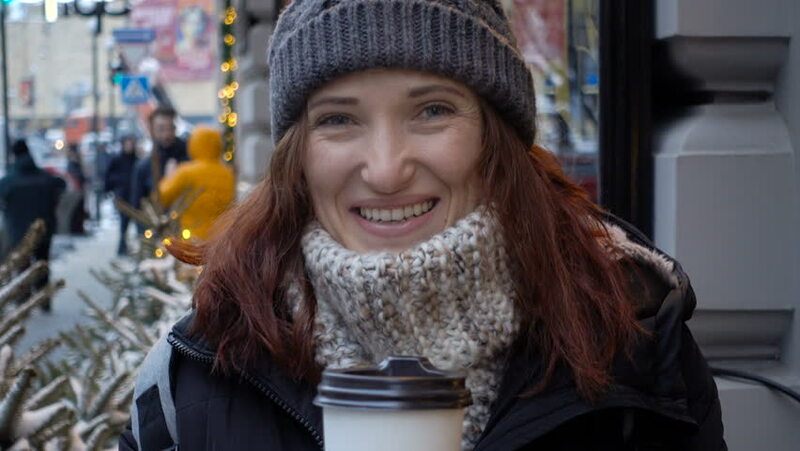 Face of a girl with a hot drink outdoors in winter. The girl is drinking hot coffee on a winter morning outdoors in the city. 4k00:13Woman opens wallet to pay for groceries. hd00:30Young beautiful woman with pigtails eating Chocolate Cookies with Vanilla Cream Filling. 4k00:38Self-video of caucasian curly-haired woman fixing her hair and making selfie-photos in autumnal park. 4k00:07Woman Laughing on High Street Portrait.